With miles of water in every direction, and a collection of cool destinations that are only accessible via a water-bound vessel, the Cape Fear area is a prime destination to launch a kayaking adventure. Take to the waves for a thrilling ride, or enjoy a leisurely exploration through a network of shallow creeks and marshes, and discover why kayaking reigns supreme as one of the most popular sports in the Cape Fear region. Ready to plot out your next adventure? Then explore these beginning, moderate, and even advanced paddling trails in and around the Cape Fear region where incredible waters are waiting. Potential Hazards: Possible heavy maritime traffic near various take-out areas. Difficulty: Difficult; transportation for put out may be required, and there are steep embankments throughout. Potential Hazards: Underwater debris, and possible submerged tree stumps. Time / Trail Length: Open ended depending on how much of the downtown waterfront a visitor wants to explore. Terrain: Neighboring waters include Snow’s Cut to the west, Mansonboro Island to the north, or the Intracoastal Waterway to the east. Want to chart your own path? There are a wide range of launching points throughout the Cape Fear area that are typically free to the public, and which connect paddlers with miles of cool coastal waters. Bordering the Cape Fear River, this site features a single launching lane, and several public amenities including restrooms, a fishing pier, and picnic areas. Close to the Masonboro Sound and Masonboro Island, this boat ramp north of Carolina Beach features parking for 30 vehicles, a launch lane, and an on-site fishing pier. Next to the Cape Fear River and Downtown Wilmington, this site features multiple launching lanes including a separate hand launch for kayaks, and parking. Carolina Beach Lake is a small, 11 acre freshwater lake that is just a few blocks away from ocean beach. This area features a launch site, and even a seasonal on-site kayak and pedal boat rental company. Exceptional starting point for beginners! Located next to the Cape Fear River, Carolina Beach State Park features a seasonal kayak and paddle rental business, multiple launching areas, and a sandy riverfront beach. Situated on the edge of Snow’s Cut and the Intracoastal Waterway (ICW), from this site, paddlers can explore the local ICW, sounds, and even the Cape Fear River to the west. Separate kayak launch and parking for approximately 100 vehicles is available. Located south of Kure Beach/ Fort Fisher, this launch site accesses salt marshes and beaches, with parking available for roughly 40 vehicles. Use caution as the area is heavily influenced by tides, currents and winds. This large parking area on the edge of the Wrightsville Beach Causeway accommodates vessels of all sizes, and provides an easy connection to the ICW for paddlers. Best accessed by more advanced paddlers due to traffic. Head to any beach to enjoy an on-the-waves adventure. Lifeguarded beaches are available throughout Wrightsville Beach and Carolina Beach during the summer season, and ocean kayaks are allowed all along the shoreline. Visitors who are new to the Cape Fear area – or to kayaking in general – can make a paddling exploration easier or as scenic as possible via a guided kayak tour. A number of popular vacation communities throughout the Cape Fear region have tour providers available to lead newcomers through natural marshes and landscapes, or through some of the most popular destinations like the heart of Downtown Wilmington. Check out tour providers in Wilmington, Carolina Beach and Wrightsville Beach – all three towns have options for 1-2 hour tours of the scenic surrounding areas. In addition, the Cape Fear area is also home to several paddling clubs where new residents and even visitors can get their feet wet while meeting fellow paddling fans. Check out local organizations like the Cape Fear Paddlers Association which has resources for paddling trails, group paddling excursions, and even volunteer opportunities. As one would expect in an area as devoted to paddling as Cape Fear, this coastal region has plenty of options when it comes to purchasing or renting new and used kayaks. For sales, head to the big sporting goods stores which are scattered throughout Wilmington, or to some of the local kayak and watersports stores that are clustered along the beach communities of Wrightsville Beach and Carolina Beach. For a nice bargain, start hunting after the paddling and visitor season is over, (generally mid to late fall), when used kayaks that were used as rental vessels may be available for sale at deep discounts. For rentals, head to the coast – and particularly Wrightsville Beach and Carolina Beach. Seasonal rental businesses are available at popular launching destinations, like the Carolina Beach State Park and the Carolina Beach Lake Park, while local watersports stores next to the ocean, Cape Fear River, or the Intracoastal Waterway may also feature hourly rentals as well as on-site launching points. In addition, the local beach communities also have several catch-all rental businesses for vacationers, which specialize in daily or weekly rentals of a host of watersports equipment – including kayaks and canoes. From picking up a ride for an hour or two, to purchasing a vessel all your own, the sheer number of options ensures paddlers of all varieties can find exactly what they are looking for. Be mindful of maritime traffic, especially in larger bodies of water like the Cape Fear River and the Intracoastal Waterway, which are regularly used by vessels of all sizes. Bug spray is a must, and especially in the warm summer months. Sunscreen comes in handy too, as the sun in the Cape Fear region can be especially strong off the water. Watch for winds and tides, which can influence an abundance of local waters. Use caution cruising through or around the local inlets, where the currents can be deceptively strong. Want a real adventure? Check out Masonboro Island. This 8.4 mile long barrier island is only accessible by a boat, and it offers miles of pristine beaches, great fishing, and good shelling conditions. Be mindful of local reptiles. There are several poisonous species of snakes in southern North Carolina which are found close to the water. Want to make some new paddling friends? Check out the local meet-up sites. There are several meet-up websites dedicated to gatherings of all varieties, which includes group paddle adventures. Want to enjoy a new take on watersports? Check out stand-up paddle boarding. This sport has taken the coastline by storm, and is relatively easy to pick up for riders of all ages and skill levels. Bring along the rods and reels! 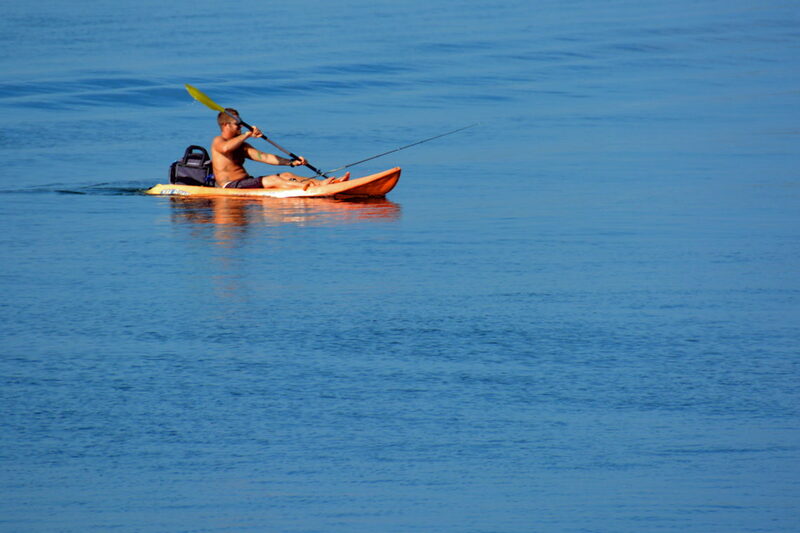 Kayak fishing is big in the region, and especially in salty bodies of water like the Cape Fear River where a wealth of species can be reeled in. Just be sure and pick up a North Carolina Saltwater Fishing License ahead of time. Kayaking is a joy in an area like Cape Fear, where countless bodies of water and scenic landscapes effortlessly connect and intertwine. Enjoy a stunning perspective of Downtown Wilmington, ride the waves near the wide beaches, or enjoy a rugged cruise to a barrier island – no matter how you like to explore, the sheer variety of options will keep paddlers coming back to Cape Fear again and again.